Boev, H. 2012. Mammals. Living Nature — an illustrated encyclopedia, Sofia, Gea Libris Publ. House, 1-80. ISBN 978-954-300-118-7. The recently released volume 1 of the 6-volume encyclopedia is devoted to mammals — the highest beings on our planet, our closest relatives. Furthermore it includes sections on the origins of life, evolution and classification of organism world. The 'Living Nature — Illustrated Encyclopedia' is the first by its design and implementation original book of encyclopedic type on natural history created by Bulgarian authors. It summarizes all the living diversity on our planet and from the first to the last page it suggests a simple fact — the man is the last being, appeared in Earth. Before about 300 thousand years, he treacherously rushes into it. As a result disappear cave bear, cave lion, mammoth... Long before the reasonable biped 'big-head' on Earth existed jellyfish, scorpions, fish, horsetail, butterflies, magnolia, beavers, vipers and spring crocuses... The main task of the authors is to show to Bulgarian readers the diversity, the beauty, importance and necessity of protection of wildlife mainly in Bulgaria and the Balkans, but also in Europe and the World. The 'Living Nature — Illustrated Encyclopedia' presents for the first time in Bulgaria in popular language data on taxonomy, structure, biology and distribution of various systematic categories of viruses, bacteria, plants, fungi and animals, but also evidence for their origin and their phylogeny. This substantial amount of knowledge presented in 166 major themes and selected bibliographic list of over 100 titles of the main literature on the Planet's and Bulgarian living multiformity is packaged in a 560-page basic text, accompanied by 1,100 color illustrations, prepared specially for this edition. 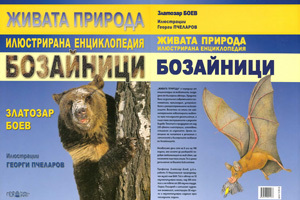 In addition to all this the 'Living nature — Illustrated Encyclopedia' is equipped with 20 original supplements on the biodiversity of plants, fungi and animals, the composition of protected plants, fungi and animals and the list of protected natural territories in Bulgaria, and phylogeny of plant, fungal and animal kingdoms, floristic and faunistic zoning of Earth, geochronological table, major environmental organizations in Bulgaria and around the World and more. Valuable tool of reader is developed in detail for five indici of the Bulgarian and Latin names of organisms, biological terms, geographical and personal names that will facilitate your diverse search of information. The 'Living Nature — Illustrated Encyclopedia' makes a kind of balance giving in separate themes also some of the most interesting newly-discovered animals (birds and mammals) in the previous 20th century. 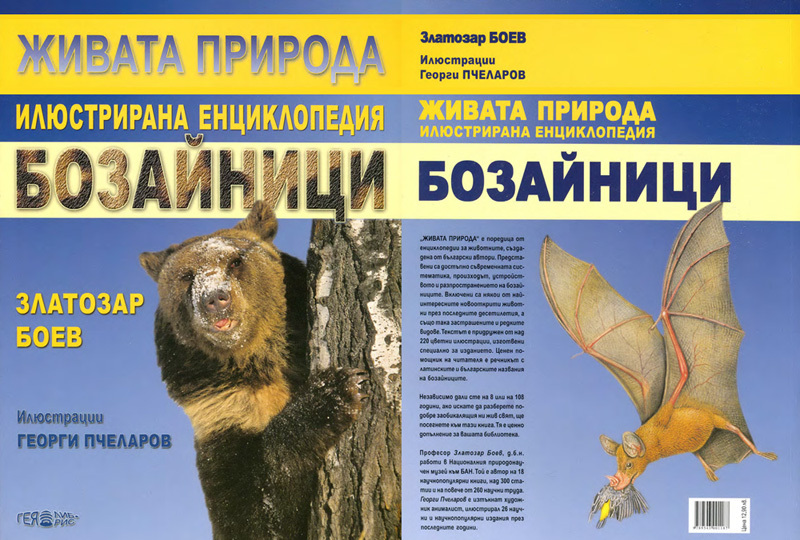 The 'Living Nature — illustrated encyclopedia' have no parallel among the books in Bulgaria, both in its scope, and the scientific credibility of the included most recent data, some of which have not even been published in the scientific literature. The zoologist Zlatozar Boev (b. 1955, Sofia) — PhD, Professor, DSc in the National Museum of Natural History at the Bulgarian Academy of Sciences is the author of the text. He is also the author of 19 popular science books and textbooks of 306 scientific and popular articles and 308 scientific papers, most of which are in the fields of paleontology, archeology, ecology and faunistics of birds. The paintings are work of renowned artist-animalist George Pchelarov (b. 1955, Ruse), 26 illustrated scientific and popular publications in recent years, most of which are joint ventures with Z. Boev. The 'Living Nature — Illustrated Encyclopedia' is intended for the widest range of readers aged 14 to... 104 years. Anyone who wants to learn something about the living world around us, in the mountains, in the woods or even in the cave — in a glass of tap water and the origin and diversity of biology, size and relationship of different groups of organisms will reach to 'Living nature — Illustrated Encyclopedia'. This book is for curious and cultured people of every home. It is protected from the mistakes of many translated editions into Bulgarian and for the first time it gives in Bulgarian correct scientific names, along with the Latin names of more than 1,000 species of viruses, bacteria, plants, fungi and animals. Presenting the latest knowledge about the living world, written by a knowledgeable zoologist and illustrated by a talented artist-biologist, the 'Living nature — Illustrated Encyclopedia' is a necessary valuable addition to every home library.